At the center of school spirit undoubtedly lies the school mascot and other representative symbols. Currently there are three symbols that are used to represent MIT: the engineer, the beaver, and the “Mens et Manus” seal. Although there seems to be no documentation on when the engineer officially became a symbol of MIT, it is likely that it has been used since the beginning of the Institute. Since MIT is primarily an engineering school, an engineer is an obvious symbol to use to represent the student body. The MIT Chorallaries have since developed an “Engineer’s Drinking Song.” This entertaining song reflects the comic and creative nature of the students at MIT. The drinking song is relatively new. It was written shortly after the creation of the Chorallaries in 1977, by David H. Bass ’83. Verses are continually added to the song and currently it boasts almost 50 different verses. These verses include ones that humorously degrade other schools and others that show the ingenious nature and boisterous drinking habits (“we can, we can, we can demolish 40 beers”) of the engineer. An amusing quality of the drinking song is that it is constantly changing. “We tend to write new verses for Bad Taste, at various times throughout the year, and the graduating seniors typically write a verse for their last concert,” said Levin. “It continually gets verses added whenever we do new events, such as the beaver’s birthday party in Lobby 7 this year, or each year at Bad Taste,” said Sheri A. Cheng ’99, the Chorallaries’ business manager. The beaver is perhaps the most conspicuous symbol of MIT. It appears on the “brass rat” class ring and a costumed beaver occasionally appears at sporting events and some student activities. The beaver mascot can also be seen in full gear at sports games and other student events. The first beaver costume design was created for the Class of 1927’s 50th reunion and unveiled at the Alumni Day luncheon. It was rented from the costume designer until the early 80’s when it was bought for $1,500. The costume has become worn-out over the years. The nose is chafed, the eyes need constant attention, and the legs are threadbare and shedding. Due to the wear of the costume, Ted E. Johnson, assistant director for programs at the Campus Activities Complex, is working with the CAC advisory board and the Undergraduate Association to develop a new design for the beaver mascot costume. The oldest official MIT symbol is the “Mens et Manus” seal that appears on MIT letterheads and other official documents. The seal contains many different items. The most prominent figures (the laborer at the anvil and the scholar with a book) represent MIT’s incorporation of science and industry into its curriculum. 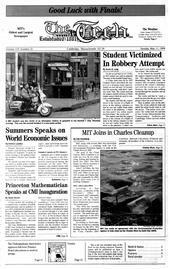 The year 1861 refers to the year that MIT was incorporated by the Commonwealth of Massachusetts. The Latin inscription “Mens et Manus” (translated to “mind and hand”) and the books that appear (entitled, “Science and Arts”) on the pedestal embody the idea of cooperation between knowledge and practical science. The seal was adopted in 1864 and was engraved in 1865 for a cost of $285. The seal was modernized during President Howard Johnson’s (1966-1971) administration. Also, the seal has been hacked numerous times and several unofficial versions are popular with student organizations on campus.